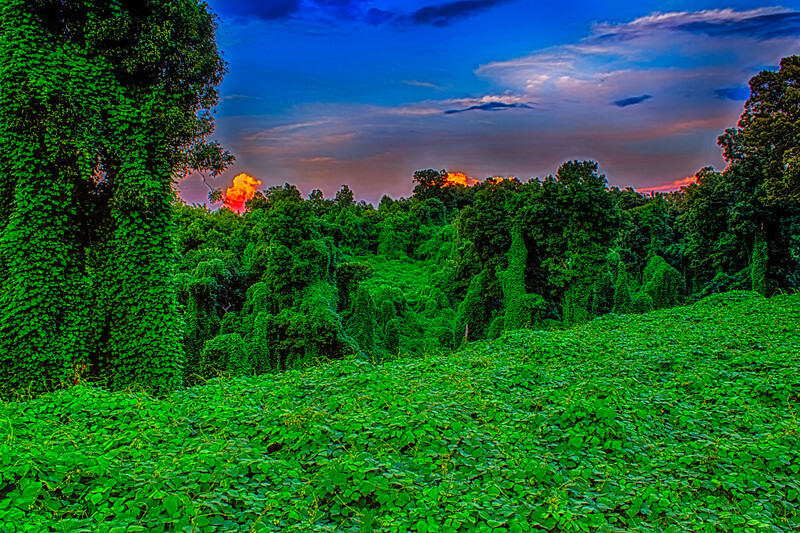 Kudzu Reverse Sunset. (Japanese Arrowroot). Unknown to landowners the plant is edible and has Medicinal uses, Animal feed, Basketry. I was driving down a country road and caught this view. This was taken as the sunset behind me a rain storm was passing through with an opening. A dark cloud blocked the sun from my view and prevented it from shining on the Kudzu but the open sky and clouds had the shine. I was standing next to the road with traffic passing by and to get as much of the gorge tripod extended above my head. Had to work fast because the glowing clouds were disappearing behind the trees. Used Promote Control set at .3 and 17 shots so +/- 3AV post processed with HDR Efex Pro 2, Dfine 2, Color Efex Pro 4.